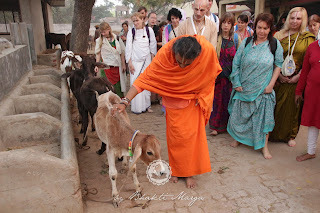 The day started in a bit more relaxed mood with abishekam to Giridhari. 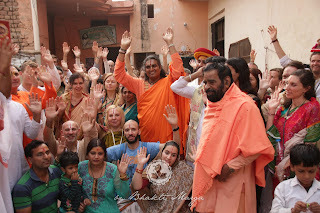 Afterwards, the group visited the temple of Jami Krishna, also known as Hukka Krishna. Every day in the temple they offer a hukka (tobacco pipe) to Krishna. It is said that one can hear the pipe bubbling when offered, signifying that Krishna is actually smoking it. 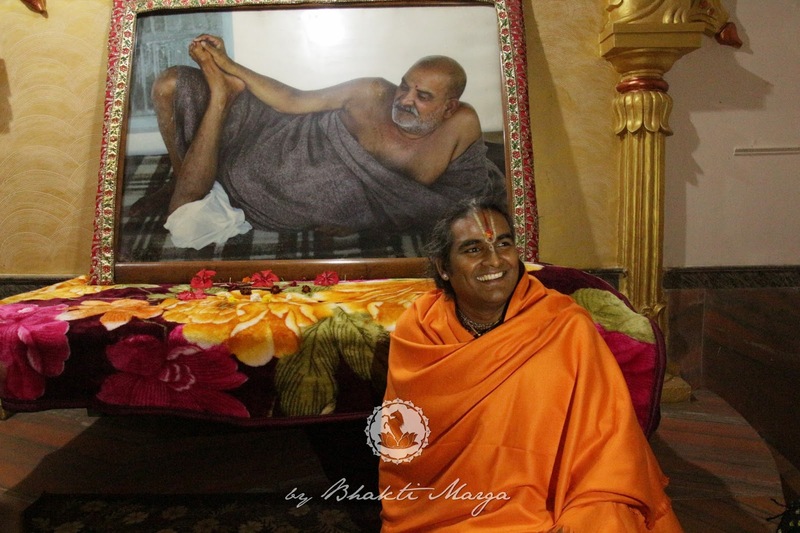 From the temple, the group proceeded to Neem Karoli Baba's Ashram where his samadhi can be found. 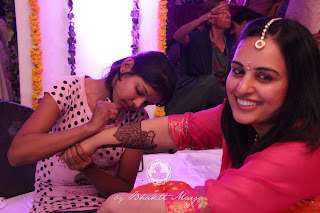 At night, the first part of a three-day wedding ceremony for Swamini VishwaMohini Ma's daughter began with many decorations, food and kirtan. "As we traveled through the streets of Vrindavan we observed Indian women putting cow dung, in the form of flat bread, on the wall for drying. It is interesting to note that the women use cow dung for many household purposes like keeping insects away. It is also a very good conductor of heat and can be used for disinfecting purposes." "As we arrived at Neem Karoli Baba's Samadhi, we met his son who told us a very interesting story. Once Baba wanted to travel by train but they wouldn't let him. As a result, the train could not move. Once the train driver realised who Baba was, he begged for forgiveness. Baba answered that he would forgive, under the condition that from then on all saints and sadhus could take the train free of charge. 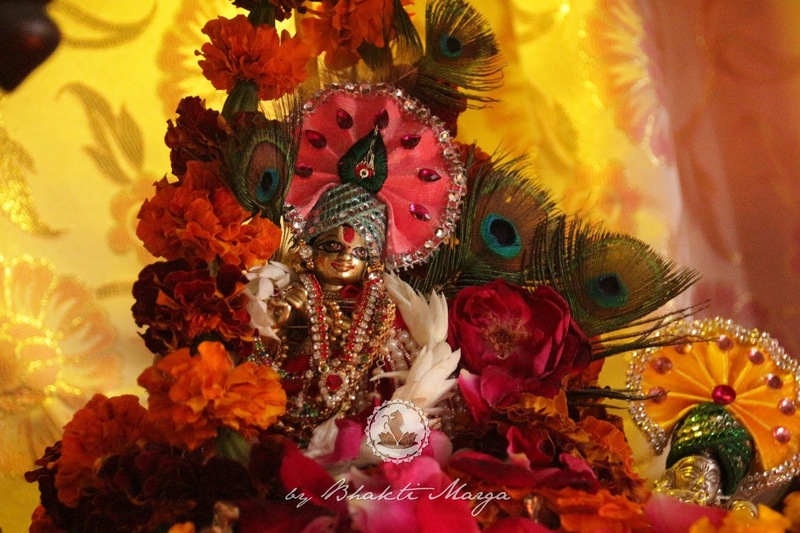 Baba is said to be an incarnation of Hanuman who represents complete surrender and devotion." "Swamini VishwaMohini Ma sang a beautiful kirtan that speaks about the real meaning of marriage. In reality, it represents the union with God; the path so that we can find God in our partner. On the first day of the wedding celebrations, it is traditional to do henna on the hands and feet, which most devotees enjoyed throughout the evening."